Brawhalla is a classic 2D side scrolling platform beat-em-up where players battle against each other using a selection of powerful characters known as Legends, each having their own abilities and play style the matches are high impact aerial acrobatic bouts upon floating platforms. With rank and unranked play players are able to play competitively and the game is already showing a promising eSports scene with various official tournaments already being held. 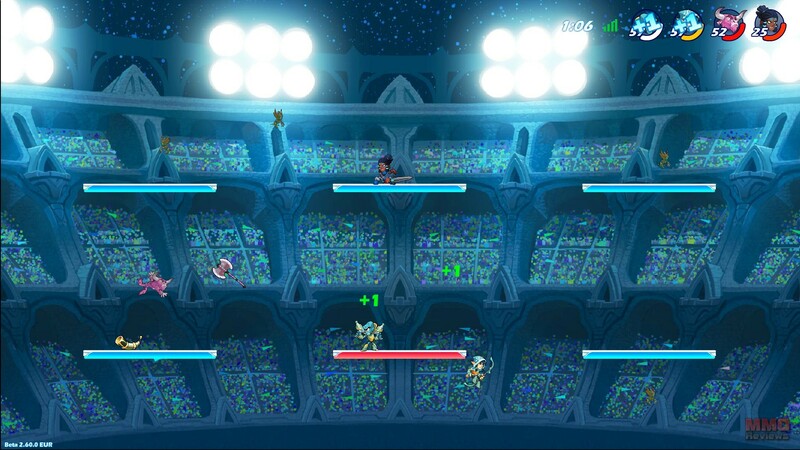 Battles consist of multiple platforms that players can jump between using dashes and double jumps creating a high mobility beat-em-up, jumping off walls and avoiding the bottomless pit below the platforms. The game uses keyboard controls for movement and left, right and middle mouse clicks to unleash different attacks that players can chain together into combos. Periodically weapons spawn in the battle for players to try and collect, fighting each other to reach them first and gaining access to their Legend’s unique weapon including melee and ranged options. As well as these a variety of gadgets appear including mines, bombs and spiked balls that can all be hurled around the arenas. A battle can have different win conditions such as trying to be the first to KO their opponent a number of times, or the player to earn the most points through the battle. When a player is KOd from taking too much damage or being knocked from the platforms, then they are brought back into the fight after a few seconds by their sidekick and can continue the battle. There are multiple maps to battle across, each having a different layout that players can learn to master, as well as this there are various modes for solo 1v1, duo 2v2 and team based 4v4 matchups, or players can experience the excitement of a 4-man free for all match. With unranked and ranked matches for competitive players to climb the rankings, as well of offline local options where you can play at home without needing to be online. Players have a wide variety of ways to customize their character, with individual loadouts that they can select at the beginning of a game, these come in the form of multiple skins, weapon skins, colour schemes and even taunts. Players also get to choose their sidekick who returns them from knockout as well as their own KO finishing move! Looking for more Free MMO side-scrolling,Free MMOs,Free MOBA Games games?